The city of Champaign is looking to join its sister city, Urbana, as one of the few cities in Illinois designated as a "bicycle friendly community" by the League of American Bicyclists. According to the Daily Illini, the city will be submitting their application to the League for the February deadline, which is listed for the 26th. The Bicycle Friendly Community Program was established for the purposes of instituting standardized measurements in comparing the efficacy of an individual city's bike advocacy. The five categories upon which the League tests an applicant city's bike friendliness is colloquially termed the "Five E's:" Engineering, Education, Encouragement, Enforcement, and Evaluation. In order to qualify for the application, the city has undergone a series of changes with regards to both its infrastructure and its motorist-cyclist culture. Just in the past few years, Champaign has installed roughly 9 miles of painted bike lanes. In addition to the city's efforts, businesses in the city have proactively pursued receiving bike friendly business designations with three of Illinois's ten bike friendly businesses being in Champaign (the most of any city in Illinois). The University of Illinois at Urbana-Champaign is Illinois's only bike friendly university. 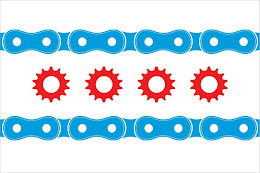 The Illinois Bicycle Lawyers at Keating Law Offices applaud both the cities of Champaign and Urbana for actively seeking to increase their bike advocacy efforts and for seeking to make cycling safer and more accessible for newcomers and veterans alike. Even though our firm is based in Chicago, we are licensed and available to handle cases throughout Illinois. Just a month ago, Keating Law Offices successfully settled a case on behalf of a Champaign cyclist who had been injured in a Champaign bicycle accident. If you have any questions regarding this post or an issue involving Illinois personal injury law, please contact Illinois Bicycle Lawyer Mike Keating by calling him at 312-208-7022 or emailing him at MKeating@KeatingLegal.com.